Is Veganism righteous in a Christian sense? If a person thinks that they are righteous from what they eat, then they have fallen into error. It’s not the food that we eat that makes us unclean. However, foods these days are made in ways that don’t help us be healthy, and also animals are kept in ways which are not anything like the way animals are to be kept according to the Bible. In the near future I will write a bit more about diet and religion, but basically the Proverb says “the righteous man hath regard for the life of his beast, but the tender mercies of the wicked are cruel”. Therefore cruelty, and the supporting of cruelty to animals is something that the Bible identifies with “the wicked”. When I think of battery hens and the way many other animals are handled I cannot but agree with the idea, that ignoring this is not the way of someone seeking to live in a righteous way. When it comes to fish, we are in a different situation. Whereas we see the meat of birds and mammals conspicuous by its absence from the table of our Lord, it’s explicitly mentioned on several occasions that He ate fish, commanded people to catch fish, etc. Therefore there cannot be anything immoral about the catching and eating of fish per se. Here I wonder about the sport of angling, where fish are repeatedly caught just for fun, and wonder how righteous that is. And I also wonder how righteous modern fishing methods are which use technology so as to go after shoals which we never would have found in conventional fishing, so that the oceans are severely depleted – except of jellyfish of course, which make up the gap very quickly and assume the proportions of a near Biblical plague. I don’t think that mass fishing methods which simply scoop up everything are biblical at all. Compare the way the Jews were commanded not even to harvest their fields to the end but leave the fringes unharvested. Nothing like that is done by the fishing industry today, which is why fish stocks are critically low. We may already never be able to get them back to what they were as the balance is now changed – the fish which will thrive the most are those which will eat the jellyfish – along of course with the plastics they contain, as they feed among the microscopic man made garbage, and we will all be eating them. We are also eating levels of mercury and other heavy metals in fish hundreds of times above what would have been the experience of Jesus in New Testament times and people should think hard before putting that in their bodies. We’re free to eat everything. We see it in Acts 10. But freedom comes with responsibilities. We are not to judge others, but to show a good example ourselves. When it comes to fish, the Seventh Day Adventists, who do it fish but don’t accept other forms of meat, show on average life expectancies in America 7 years longer than normal Americans. So even with the eating of fish, you still get the main benefit of vegetarianism, a healthier life, if you refrain from the other sorts of meat. I’m not a fan of a number of theological points of SDA’s, but some things they are quite correct in. And on that basis I do eat fish very occasionally. I’m eating about 10-20% of what I would have eaten before. Being non-kosher, shellfish would not have been on the plate of our Lord, and things that He would not have eaten I would also prefer not to eat. It makes a good witness to the Jews also, so when eating with them it assists matters a lot to remember that shellfish are off menu. They are also the ones in the front line for absorbing the mercury and heavy metals which sink down in the water. God’s plan isn’t really a world in which his creatures bite and devour one another. This came into the world when sin came. And whilst it’s a tolerated reality of this world, I would rather anticipate that when Jesus comes to reign we will all be eating vegetables, even lions and tigers then will be trusted to lie down with the lamb and the gazelle. This is indeed prophesied in the Scripture and in some way it will come to pass. These creatures may be giving up willingly their milk and honey without cruelty, or maybe we will have no appetite for milk and honey either. I suspect the former will be true, as Israel, which is a prophetic form of God’s Kingdom is described as a land flowing in milk and honey. Until that time I would sooner err on the side of caution, though. 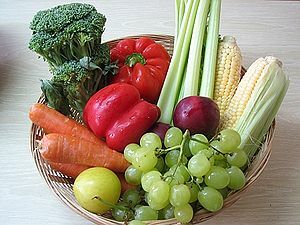 Even the consumption of vegetables can be sinful if a person eats thanklessly, so the final thought here sure be that whether a person eats flesh or just eats as Daniel did, they should in any event eat as to the Lord, and eat thankfully, with worship of the Creator in their heart. Dietary choices don’t add to or detract from the salvation of the believer in Jesus one iota. But they can cause improvement to our health, reduce our impact on the world making more space for future people who also can become members of Jesus’ kingdom, increase our effectiveness, improve our sense of taste, give witnessing opportunities and a deeper understanding of certain Biblical issues and experiences. Fish aren’t vegetables, are they? Many changes have been made to taxonomy since I was a schoolboy and had a basic grasp of what went in what kingdom, phylum, class, order, family and genus, but when I last checked, fish STILL weren’t vegetables. I don’t want to get unduly Aristotelian, Linnean, Cladistic or othewise dogmatic about it, but I think it stands to reason that vegetables include many things, but rather not fish. I understand that you can debate about whether a tomato is fruit or a vegetable. Or that a mushroom is a fungus rather than a vegetable, and also that nori is made of algae and green drinks from spirogyra so even these things are not really “vegetables” either, so one has to be a bit flexible with the definition of what is a vegetable when following a vegetarian diet. Basically, though, if something can move around at will, an individual going from place to place, it’s highly likely that it isn’t a vegetable. There are some corals which don’t get out much, and are still animals, but there aren’t really any vegetables which go walkies – not outside the novels of John Wyndham like the Triffids, anyhow. So why, then, am I continually being offered things like tuna and herrings when I say that I am a vegetarian in Poland? Do people here genuinely believe that fish are vegetables? Do they think that tuna and herrings photosynthesise and put down roots or something? What’s up with these phoney fish vegetables people give offering me here? Pastor Harmut Ising has sent me a bit more material to read about this film and has kindly allowed me to share it freely. See the following pdfs. They are great studies of prophesy in the Bible, in German. If there’s one thing I miss about the old firm’s conferences it is the amount of music and entertainment they laid on. The ones done by my current group are a bit more low key in that regard. Here’s an example of what the opening ceremony of the Cape Town conference looked like. This series, possibly beginning with this one, even though it is the 102nd video uploaded to YouTube, marks a certain development in the way I presented the video material. The cutting in of background music, the use of a common intro for series, the gallery shots with background music. This is an early prototype of about 2 or 3 hundred similarly style films from travel to different places. It’s not exactly the mode I settled into, but it’s well on the way there. One thing I quite like about this one looking back is the attempt to use music in the backing track together with the ambient noises, like the drums of the waterfront performers here on the Victoria and Albert Waterfront in Cape Town. I have great memories of this place and would be happy to go to Cape Town again if ever I get the chance. Apart from anything else, there were friendships made there which gave me a lot of value in my life. Just that alone, even if it had been nothing like the paradise it was, would have been well worth the trip. This is a video you might like to watch if you are interested in the sorts of things that might happen if they lose your luggage on an intercontinental flight. We have a look at the room I got at the Arabella Sheraton in Capetown. They managed to lose my luggage (that was my first time so far for lost luggage, first of many) and so we have a look at KLM‘s so-called “care collection”. I had lost luggage with Lufthansa and with KLM and both of those companies behaved properly. I had lost luggage with SAS and they were hopeless and impossible. When the luggage finally appeared it had been plundered and no compensation was available as it was only one day before the 14 days they say. The upshot is I never flew SAS again, but I still fly Lufthansa and KLM with confidence. In this seventh lesson in the 10 lesson course on the Russian alphabet known as RL-101 series, we find ourselves in the Arabella Sheraton in Cape Town South Africa, with table Mountain looming behind my head. This is the perfect setting to place a new set of consonants on the table, namely the sibilants. The problem with the sibilants as far as Cyril and Methodius and their acolytes were concerned is that that is a group of consonants which you simply would not find in either Latin or Greek. To this day these sounds present difficulties to people transcribing Russian sounds into Western European languages. So whereas the sounds that we have met until now have come from Greek into the Cyrillic alphabet, the missionaries to the Slavs had to look for another source in order to render these sounds in Slavonic. Hebrew was the next choice, being another biblical language. The letter shin and the letter tzaddi are both sibilants in Hebrew, so they were brought in and also amended, so that from shin we derive three sibilant letters in Russian, and from tzaddi we derive two. how’s it going? как дела?